Imagine you are visiting a relative at an apartment complex or shopping at a new business in town when suddenly you are injured by falling down due to an uneven ground surface or a defective piece of furniture. What you thought was a minor injury turns into a debilitating condition that prevents you from walking or functioning in the same way as before the incident. Unfortunately, these slip, trip, and fall accidents are extremely common in New Jersey. Our attorneys at Brady, Brady & Reilly, LLC are available to help you handle the legal process for obtaining the compensation you deserve for your injuries. In cases where you sustain injuries on another person’s property, you are able to file a premises liability claim against the property owner to reclaim restitution get compensation to help with medical costs and other financial damages. Although some premises liability injuries may seem minor at first, symptoms which worsen or show up days later can have a prolonged impact on a victim’s life. This is especially true in instances where victims sustain neck, spinal cord, or back injuries that result in the delayed onset of excruciating pain. Whenever you are involved in an accident on someone else’s property, it is crucial for you to go to the emergency room as soon as possible. You will need to undergo medical evaluations to determine the extent of your injuries. Additionally, it is important to begin documenting your injuries early on, in order to strengthen your personal injury claim. Who Can File A Premises Liability Case In New Jersey? Most people who are injured in an accident that occurred on another person’s property are able to file a lawsuit against the property owner through premises liability laws in New Jersey. In premises liability cases, owners of the property where the injury occurred are financially responsible for injuries sustained by guests. Under New Jersey law, property owners have a legal obligation to maintain their properties in a manner which is aimed to prevent injuries to others who enter upon their property legally. Hotels, casinos, resorts, and other commercially-owned properties throughout New Jersey are often held to much higher standards. Nonetheless, property owners who do not adequately provide duty-of-care to property guests can be found guilty of negligence in New Jersey courts, which means they failed to take all reasonable measures to ensure guests are safe and, as a result, someone visiting the property suffered an injury. For injured parties to file a successful lawsuit against the property owner under premises liability in New Jersey, they must prove that the property owner knew about the dangerous condition or that they should have known that the conditions existed on their property. Additionally, the claimant must prove that the property owner was negligent in addressing the dangerous conditions and, as a result of such failure to address those conditions, the claimant suffered an injury. Working with an attorney from Brady, Brady & Reilly, LLC who is well-versed in premises liability laws in New Jersey will ensure you obtain the outcome you desire for your case. Premises liability lawsuits only succeed when the property owner does not take all of the precautions necessary to prevent accidents from happening on their property. If a property owner does not mark off a spill or clean up the floor, or if they fail to clear up broken glass and display a clear sign noting the break for visitors, they are considered as acting negligently. A person injured under these circumstances may have grounds for a personal injury case against the property owner. Alternatively, if a guest is injured in an area that is appropriately marked, they are most likely not going to succeed on their lawsuit against the property owners. Notices to guests, such as a “Wet Floor” sign or a “Broken Glass” sign, clearly indicate that the area presents some type of danger to individuals who are not careful in the area, or that they should avoid the area so they are not injured. Guests who blatantly ignore these notices cannot hold property owners liable for resulting injuries. Handrails on staircases were broken, missing, or damaged. There are numerous ways individuals can sustain injuries on other people’s property. Below are some examples which demonstrate common premises liability claims. Swimming Pool Incidents: Homeowners with swimming pools are at an increased risk of having children enter their property to swim in their pools. When children are injured or drown in pools on other people’s property, the homeowner can be held liable under the “attractive nuisance doctrine.” In New Jersey, homeowners are required to have their pools fenced or walled-in with a structure that is a minimum of five feet high. Failure to adequately enclose the pool could be grounds for a lawsuit. Public pool owners are at risk as well. Guests can hit their heads on concrete structures that are in and around the pools. If there are no lifeguards at the pool, the guest could drown. There are many cases of traumatic head injuries, broken bones, and back injuries at public pools. Dog Bites: Homeowners who adopt dogs and fail to keep them adequately leashed or trained place others throughout the community at an increased risk of sustaining bites. This risk is further increased when a property owner has a dog that they know is vicious, yet they fail to properly restrain it in circumstances where others could be harmed. Improper Security: One of the most important ways a property owner can ensure guests’ safety is by implementing adequate security measures on their property. It is important for property owners to have security guards when necessary, maintain properly-lit alleys, lots, walkways, garages, and have security cameras around the property. Negligent security measures can increase the likelihood for guests to become victims of violent assaults, robberies, and rapes. 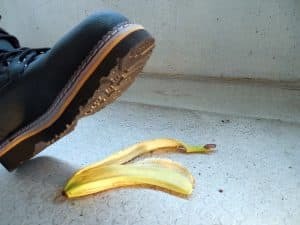 There are also numerous instances where guests are injured through slip and fall incidents due to inadequate lighting, slippery or broken floors, and poorly maintained stairways. Sustaining injuries on another person’s property means you most likely need costly medical attention. Depending on how severe your injuries are, you may suffer from excruciating pain that drastically limits your ability to work. Brady, Brady & Reilly, LLC can help you obtain a fair settlement to compensate you for your injuries and the financial damages you sustained from your injuries. Filing a premises liability lawsuit against a property owner is an extremely complicated legal process. Simply being injured on another person’s property does not guarantee that you are entitled to compensation. It is crucial for victims to prove that the property owner is liable for the injuries in New Jersey courts. Doing so successfully requires proving that the property owner was aware of the hazard or that they should have been. A claimant must also prove that the property owner did not take appropriate actions to rectify the issue. 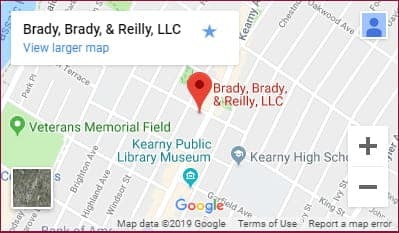 As your legal counsel, the lawyers at Brady, Brady & Reilly, LLC will work diligently on your case to ensure all the facts surrounding your incident are adequately represented through witness testimony, photographs, and investigations of the scene of the accident. We fight to win and leave no-stone-unturned as we build a strong case on your behalf. Slip and Fall Accidents: These claims are commonly filed by individuals who sustain injuries from falls on slippery or uneven surfaces, surfaces with holes or cracks, or from areas with broken glass, concrete, or other hazardous objects. Swimming Pools: Pool accidents are often filed when guests are injured on fountains, concrete structures, and other objects in and around the pool area. These objects can fall on guests and cause catastrophic injuries. In some cases, individuals suffer illnesses in the pools and drown from not having a lifeguard on site. Food Poisoning: Individuals who consume food that is inadequately prepared, handled, or stored can develop food-related illnesses. These illnesses can be extremely debilitating or life-threatening, especially to guests with compromised immune systems. Assault: Unfortunately, individuals who go to public properties that are poorly lit and secured can suffer injuries from an assault and other violent acts. If a property owner does not have adequate lighting and security and, as a result, a guest is injured, they are able to file a lawsuit against the property owner for their injuries and damages. Other common injuries in premises liability claims in New Jersey are the result of damaged furniture, bedbugs, concert accidents, damaged property, and dysfunctional elevators. Lost Wages: When injuries prevent a person from working, they are able to request the court to award them money for their lost wages. These can be claimed for short periods, like having to miss work to go to appointments or for recovery, or lost earnings can be awarded based on a person’s inability to return to work indefinitely. Medical Expenses: Courts are able to award repayment for all past, current, and future medical expenses related to injuries or illnesses resulting from the accident, including treatment, surgeries, tests, and therapy. Pain and Suffering: Victims are able to obtain restitution for the physical pain and suffering they experience as a result of their injuries. The jury or judge often take into account the severity of the injuries and the impact they have on a victim’s life when awarding damages for pain and suffering. Mental Anguish and Emotional Distress: Psychological symptoms can exist on their own or in addition to pain and suffering. These often result due to traumatic events and can be extremely debilitating. Loss of Consortium: These damages are awarded in reference to a person’s inability to engage in companionship-related activities with their spouse or loved one at a level they once enjoyed. These damages can be quite significant, especially in cases where the accident led to severe impairments. Lost Opportunities: These damages are sometimes recoverable in addition to lost wages and future earnings. These damages are awarded in reference to business opportunities that may have been eliminated for the victim as a result of their accident. Claimants need to clearly and convincingly prove the lost opportunity exists in order to recover the financial compensation that you so rightly deserve. Our well-respected attorneys at Brady, Brady & Reilly, LLC have been helping accident victims in New Jersey acquire full and fair compensation for their injuries since 1965. Our extensive knowledge of the law and our tenacity in the courtroom have resulted in our clients obtaining favorable outcomes in their cases. If you have suffered an injury on someone else’s property and it was not your fault, you may be able to pursue a premises liability lawsuit. Call a qualified and skilled member of our legal team to speak with a premise liability lawyer about your injury accident at Brady, Brady & Reilly, LLC today at (201) 997-0030. We can schedule a free and confidential consultation. We are available 24 hours a day so give us a call today.